Trinbagonians erupted with joy when on October 27, 2011 Anya Ayoung-Chee was formally declared the winner of Project Runway Season 9 with her presentation “Tobago Love” which was shown at the 2011 Mercedes-Benz Fashion Week, New York. Her story is now well-known — the 2008 Miss Trinidad and Tobago Universe representative only had four months formal training in sewing, tutored by Delia Alleyne from Tobago, at the time of the casting call for Project Runway. She was able to charm the judges, most notably Heidi Klum and viewers alike with an effortless self-assurance and grace which was undoubtedly aided by her personal style, feminine physical appeal and her Trinbagonian accent. Week to week, Anya demonstrated that she was good at what she did – she had a remarkable eye for prints, colours and patterns. Admittedly though, her designs seemed predictable and one-dimensional. That was until she proved that she could step out of her comfort zone with the “This is for the birds” challenge producing a very chic, all black garment with good structure. Fellow competitor Joshua was upset over this win, pointing out that she had to sew the model into the garment – a claim that he would make for several of her pieces. Despite her doing well in some challenges, Anya also produced an ill-conceptualized and poorly styled dashiki-esque men’s shirt for the challenge where competitors had to style members of a 70’s-inspired rock band. She herself expressed disappointment about her work and her lack of sewing skills showed. Then there was the drama. Somehow Anya managed to lose money for the Sew ’70s challenge in Episode 10 which was to be used to purchase materials. Despite getting only $11.50 to purchase material from one of the contestants and resorting to using muslin fabric, Anya was able to whip up an innovative outfit and, together with a second look, was able to win the challenge. A tell-tale sign of the value placed on her even by fellow competitors was revealed in Episode 12, when competitors were asked which other two designers they felt should advance with them, Anya was picked by all other remaining contestants. Her willingness to listen to the judges’ critiques and develop ‘new-looks’ outside her comfort zone of tropical themed designs balanced off assertions that she was not experienced enough in her sewing. And then there were four – Kimberly Goldson, Viktor Luna, Joshua McKinley and Anya Ayoung-Chee. Competitors were given six weeks to design and create a collection to display at Mercedes-Benz Fashion Week. Disappointingly, Tim Gunn travelled all the way to Trinidad to provide critique assistance to Anya in her preparation for the big fashion event but Anya had nothing to show save for some sketches and material. When the competitors were judged for the final time before Fashion Week, Anya, in our view, had the poorest showing of all with two out of three bad outfits. The choice came down to Anya and Kimberly who also had some design and accessory issues but, to many, was still better off than Anya. Anya, then and there, could have been eliminated. However, the judges, probably considering Anya’s general good performance throughout the season — having been the only contestant to win three of the challenges and/or the fact that she was the fan favourite, allowed all four to show at Fashion Week. Of course, this was not stated but it seemed pretty glaring to several observers that the judges wanted Anya. When it came down to it, Anya did manage to pull off a beautiful, though one-note collection. It was by far the most cohesive collection of the four and really showcased her signature look excellently. Her victory in the final round, although debatable, was well-deserved. 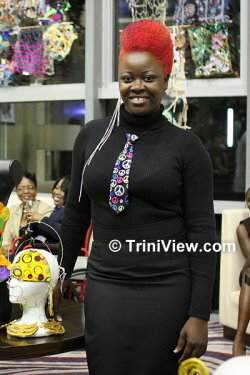 Trinidad and Tobago has every right to be proud of Anya. Her growth throughout the season was evident and her conduct, delightful.